This is the second book in the Fairwick Chronicles series. I have previously reviewed the first book, The Demon Lover. This review may contain spoilers for The Demon Lover. I don’t really have ALL THE THINGS to say about The Water Witch, it is definitely the second book in a trilogy, more bridge than anything else. 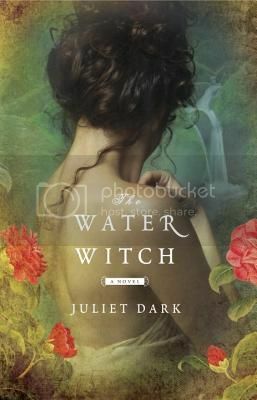 The events of The Water Witch pick up right after those in The Demon Lover and, honestly, not a whole lot of new stuff happens for much of the book and, when things do start happening, they seem to be more a set up for the third book than anything else. That being said, The Water Witch is still totally engaging and if its purpose is to make me want to read the third book in the series, coming out in September, then it did its job well. Recommended. I want to read this series — the covers are so pretty and the premise so interesting! The covers – of this one in particular – are what drew me in in the first place. Didn’t seem like it made much of an impression? It isn’t that so much as that the part of the book that isn’t following up the first book or setting up the third is really small and there isn’t much to say about it for those who haven’t read the first book. It doesn’t really stand alone.